George Scobie is a British policemen, who has been living and working in a west African colony for the past 15 years. World War II now rages around him, but he and is wife Louise are isolated in a small port city, far from the civilization they knew. The love has long evaporated from their marriage and Louise is unhappy with her life and begs George to buy her a ticket to South Africa. George cannot afford the ticket on his small salary, so he borrows the money from a local black marketer of questionable scruples. After Louise's departure, George begins an affair with the recently-widowed Helen Rolt. 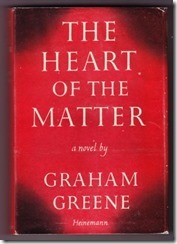 This is the happy plot of The Heart of the Matter by Graham Greene. It is not an adventure story because very little action takes place. It is not a love story, because George clearly does not know what love is, although he tells himself that he does. It is an exploration of the mind and sould of a weak, but well-intentioned man, who struggles with morality and his choices and his sins. George Scobie tries to be a good man; but he is never honest with himself - even deluding himself into believing his affair is kept secret from others in town. He is weak: He recognizes and confesses his sin; but is powerless to keep stop from repeating it. His best trait is that he does not want to hurt anyone. He is motivated by pity (an emotion he often mistakes for love) and he tries to find a solution that will hurt neither Helen nor Louise. Invevitably, everyone is hurt by his inactions. Scobie is a practicing Catholic, but he cannot go to confession because he knows his adultery will continue and, therefore, will not receive absolution. He is tempted by suicide, but his religion has taught him this is an unforgiveable sin that will result in eternal damnation. In the end, this unrepentant sinner rationalizes a path that he thinks will hurt the least number of people; but, ultimately has no positive impact on anyone. The Heart of the Matter raises moral questions, but leaves it to the reader to answer them.